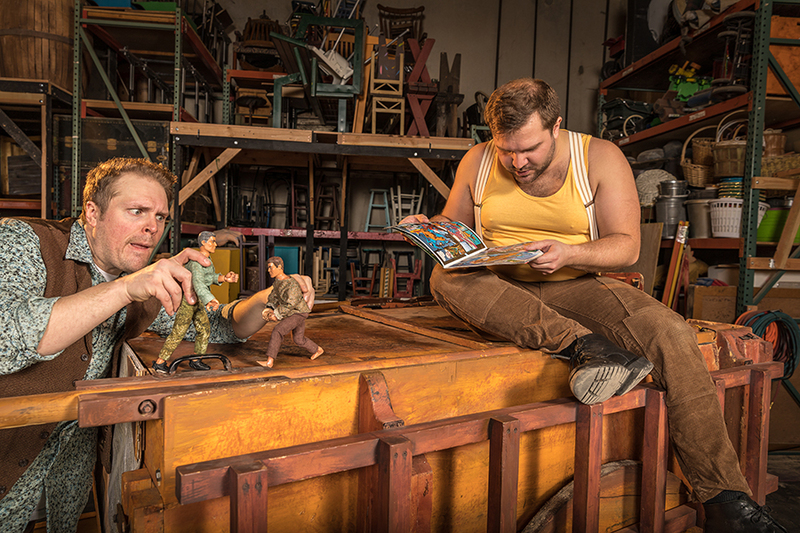 How can two actors take on the entire story of Jason and the Argonauts? With a wagonful of wooden swords, paper boats, comic books, silly masks, and action figures, of course! Jason’s uncle isn’t exactly lovable…he’s murdered his brother (the king), stolen the crown, and torments his subjects. But Jason is ready to shake things up! He wants to reclaim the throne and be a better ruler, but to do so he and his crew (The Argonauts!) must first sail to the ends of the earth and capture the Golden Fleece. OCT's first international collaboration brings this award-winning production from Visible Fictions (Scotland, UK). Don't miss this quirky and hilarious retelling of a classic tale! Be strong and resilient to reach your goals. It's important to know history. Kindness and empathy go far in leadership. Jason and the Argonauts (2019). Photo by Owen Carey. Jason and the Argonauts. Illustration by Brian W. Parker. In collaboration with Visible Fictions. By Robert Forrest. Original director – Douglas Irvine.